This is, by far to me, my mother’s favorite dish. 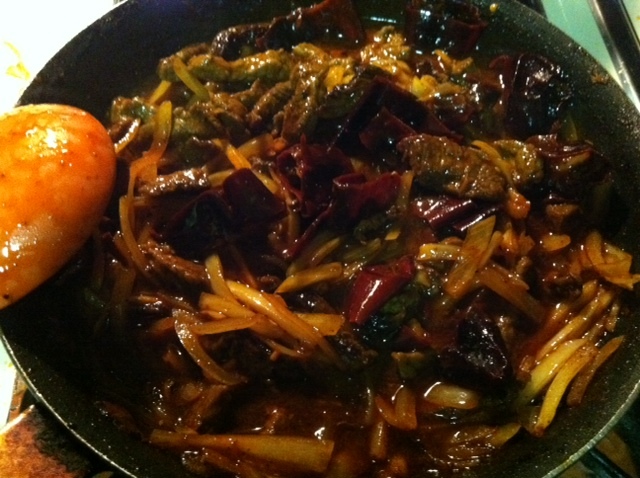 It combines Chinese stir fry, with Adeni flavors. Simple, easy and delicious. 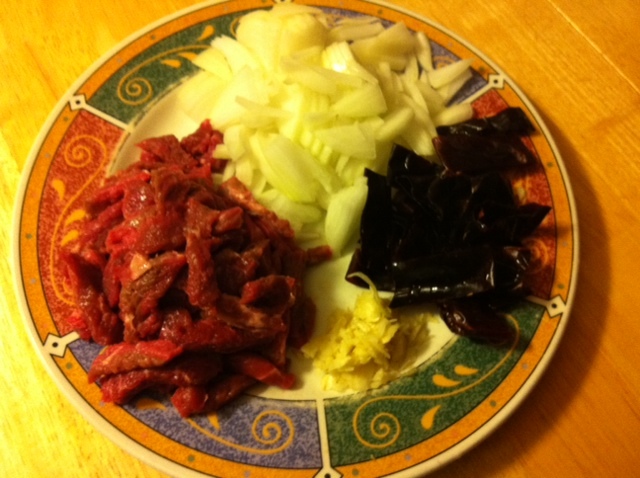 First, fry the beef in a frying pan in the oil, until they are browned. Take out once browned onto a paper towel. Here they are chilling out . Salt them lightly. Now back to the frying pan, you should have some oil left, if not add a little more. Add the liquidized red chilly’s, garlic, black pepper to the oil and sautee well for a few minutes like so. Then add the dried chilly peppers,and let sautee some more. Add the onions, and let cook for a few minutes–I like them a little crunchy so I don’t cook them that much. 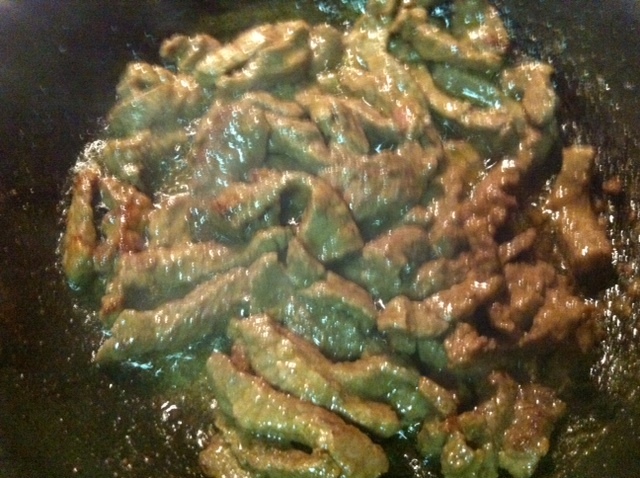 Add the fried beef, and cornstarch melted in a 1/4 cup of water. Salt and let cook under medium heat for a few minutes. 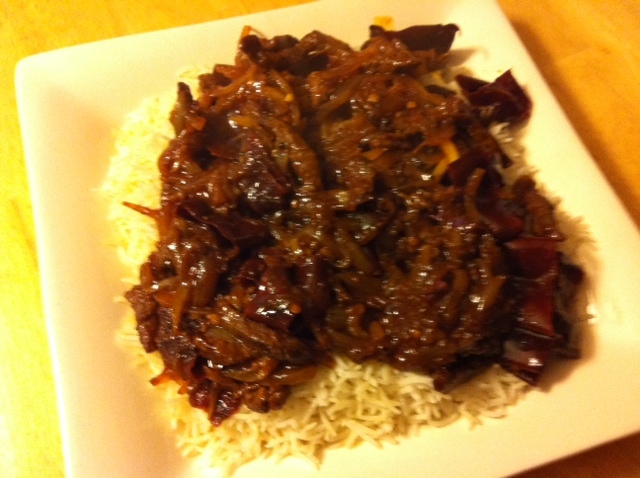 Serve on a bed of white rice, and with some cool yogurt. Enjoy! Why aren’t the pictures showing up i wonder? They do show up on my computer–does it say that it requires a plug in of sorts? Add the juice of a whole fresh orange to this one! It’s great. I love your recipes.